In Brief: Hike hill trails from a tiny and isolated valley village to reach the Great Wall, first following a narrow trail beside the wall and then up on to the Jinshanling Great Wall, a partially-restored stretch with many intact and closely-spaced towers. Some sections steep. Views of the Great Wall above Hemp Village. 3–4 hours start to finish over around 10km. Note: we’ve heard rumours that Jinshanling may close for upgrades to the park infrastructure. So far there are no dates or anything official, and we’re still planning to run this hike. If there are any updates we’ll let you know as soon as we hear. 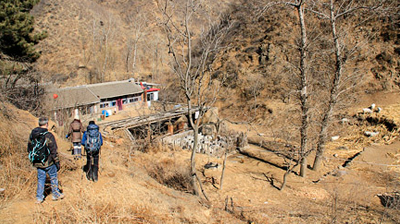 We begin this hike with a flat walk up a valley to reach Hemp Village, an isolated settlement in the hills on the border of Beijing and Hebei Province. There are about 100 people living in this valley, surrounded by hills on all sides. They mostly grow corn in this area, but in the right season you can spot hemp and tobacco, and there are donkeys, cows, chickens, and dogs about the place as well. One of the last houses in Hemp Village belongs to our local guide, and he’ll take us up to the Great Wall. If there’s time (and interest! ), we might be able to have a look about his property—a good chance to see how folk survive in the freezing winter in the Chinese countryside. A house at Hemp Village. Our local guide has made a trail from his house up to the Great Wall, and we’ll follow it up to a flat spot beside the wall on the ridgeline. This section of the wall borders a military area, and walking on it here is not permitted. We’ll first follow a trail beside the wall, scrambling up and down a few steep hills before we get to a lookout point. Note: steep! The trail up to the lookout point goes up a fairly big hill. Take a break on the way up! From the lookout point we can see all of the Jinshanling Great Wall, a partially-restored stretch with many intact and closely-spaced towers. Much of the Jinshanling Great Wall is outside the Beijing Municipality, in Hebei Province. It’s a well-known part of the Great Wall that is in good condition after a lot of restoration work, and it is extremely picturesque, with large towers that are more closely-spaced that usual. Not far from the lookout point, we’ll be able to pass through an archway in the wall, getting us back on to the south side. The south side is the Beijing side, and we’ll find a small door that allows access to the wall. From here we’ll be walking on top of the wall, following it to the main pass of Jinshanling. We’ll follow the Great Wall towards Simatai. The walk is steep in places with a lot of steps – in one place it’s 107 steps up, then 120 steps down. This means it can get a bit tough on the knees, but the views make up for any temporary pains. Before heading back to the city, we’ll have a late lunch (perhaps after 2pm) at a local restaurant. The cost of food and drinks is included in the price of the hike. There are some steep and slippery sections of trail in the first third of the hike, with parts getting quite narrow. See a set of 20 photos from the walk from Hemp Village over the hills to the Jinshanling Great Wall—beautiful blue sky and long views of the wall. An unexpected snow day! See fifteen photos from our hike from Hemp Village to Jinshanling. See 12 photos from a hike from Hemp Village over to the Jinshanling Great Wall. Twenty-two pictures of a beautiful clear day on the Jinshanling section of the Great Wall. Photos from the hike through the hills from tiny Hemp Village over to the Jinshanling Great Wall. The Jinshanling section of the Great Wall is one of our favourites: it’s an impressive example of Ming Dynasty Great Wall, it has a mixture of restored and unrestored areas, and it’s far enough out of the city to not be totally crowded. We like this hike for its great combination of historical significance, natural beauty, and good exercise! Click through to see some photos from a visit in September 2011. On the last day of July we took a trip out to the Jinshanling Great Wall, just over the border in Hebei Province. 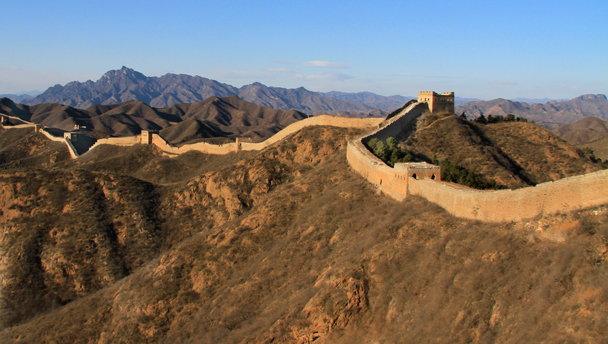 The skies were clear, and we enjoyed great views of the Great Wall – click through to see a few photos! The section of the Great Wall at Jinshanling is becoming a better known destination as the adjacent section at Simatai has been closed down for renovations. We hiked under a clear sky to enjoy incredible views of one of the most beautiful sections of the Great Wall. Click through for photos and more! We had great weather and a friendly group of people for this trip to the Great Wall, and were accompanied for some of the way by an expert from China’s Great Wall Conservation Association. The weather was perfect for photography - click through to see some photos from the trip.